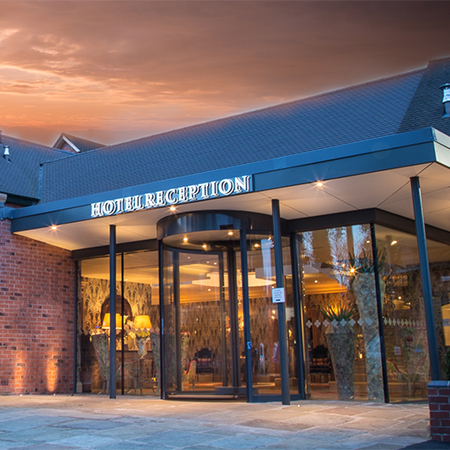 As part of a programme of extensive renovation, TORMAX was specified to install a four-wing automatic revolving door to the main entrance of the four-star Grosvenor Pulford Hotel, Chester. 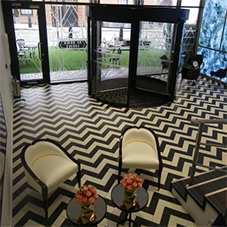 Blending seamlessly with the eighteenth century building, the new revolving door successfully combines the elegance of a by-gone era with the convenience and welcome luxury of an automatic entrance. Driven by the technologically superior TORMAX 5201 motor, reliability and smooth operation is assured for many years to come. 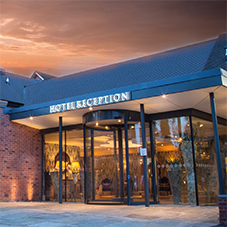 The Grosvenor Pulford Hotel and Spa has been significantly upgraded since the family-owned, Nelson Hotels, assumed ownership of the property in 1994. Main contractor on the most recent £1.5m project, HH Smith & Sons of Manchester, has been responsible for the construction of a stunning two-storey reception with new mezzanine floor above. The impressive external glass wall at the front of the property was contracted to Glass & General Maintenance who worked with TORMAX to deliver a first-class automatic entrance. In addition, a self-monitoring function optimises door performance, automatically adjusting movement in response to factors such as wind resistance or a build-up of dirt for example. 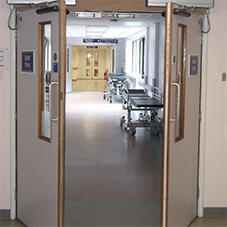 If an emergency should lead to power failure, the Grosvenor’s revolving door can be used manually to ensure unrestricted egress.